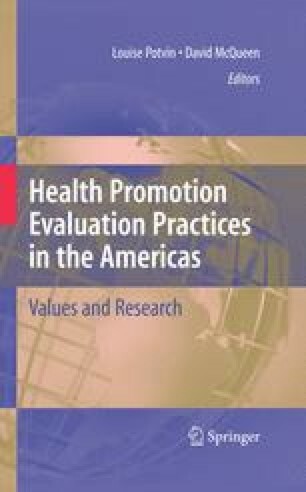 This chapter is a contribution to the evaluation debate in health promotion. It explores the strategies for, and main concerns in, identifying and formulating relevant and answerable evaluation questions. Unlike many previous texts discussing what is involved in developing evaluation questions, in this chapter we argue that a wide range of contextual and highly political factors contribute to the framing of evaluation questions. Furthermore, we strongly believe that the same intervention can lend itself to a variety of different evaluation questions depending upon the stage of intervention development at which the evaluation is conducted. Finally, we contend that the evaluation question or set of questions should reflect the ever-changing context of the intervention, as well as the stage if the intervention, if evaluation is to be truly useful for health promotion. EPPI – Centre (2006). “Cochrane Health Promotion & Public Health Field” [en línea], disponible en: http://eppi.ioe.ac.uk/cms/Default.aspx?tabid=269, recuperado: 4 de febrero de 2008. Organisation for Economic Co-operation and Development (OECD) (1998). Review of the DAC Principles for Evaluation Development Assistance, [en línea], disponible en: http://www.oecd.org/dac/evaluation, recuperado: 5 de enero de 2004.